This recipe for Jewish hamantaschen cookies shaped like a three-cornered hat are representative of Haman's hat (see more about Haman below) and eaten for the holiday of Purim. These flaky pastries start with a parve margarine dough (although butter can be used for a dairy meal) and are traditionally filled with apricot prune, and poppy seed filling but, these days, even chocolate and other fruit fillings are popular. Cream together sugar and margarine. Add eggs and cream until smooth. Stir in water and vanilla. Add flour, mixing until dough forms a ball. Wrap in plastic and refrigerate a few hours. Heat oven to 375 F. Line baking sheets with parchment paper. Pinch off walnut-size pieces of dough and roll into a ball. Press ball between two pieces of waxed paper and transfer to the prepared baking sheets spacing about 1 inch apart. Place about 1 teaspoon of filling in the center of each circle of dough. Pinch to form a three-cornered hat. Bake about 15 minutes or until just starting to brown. Using a thin spatula, carefully remove the cookies to a wire rack to cool completely. Store cookies in a tightly covered container. Chocolate Hamantaschen Recipe: This is a dairy dish in the kosher tradition because the cocoa powder pastry dough is made with butter. It can be filled with prune, poppy seed or apricot, but they taste oh so much better with raspberry, Nutella, white chocolate chunks or chocolate peanut butter. Rose Water Pistachio Hamantaschen Recipe: This is another dairy cookie because the dough contains butter flavored with rose water. The surprise? A filling made with pistachio marzipan. Haman is the antagonist in the story of Queen Esther who saved her people, the Jews, from being killed by edict of the evil Haman. The story is detailed in the Biblical Book of Esther. The word "Purim" is derived from Haman having cast the pur (the lot) against the Jews to no avail. Purim is celebrated annually according to the Hebrew calendar on the 14th day of the Hebrew month of Adar (Adar II in leap years) and usually falls in February or March. 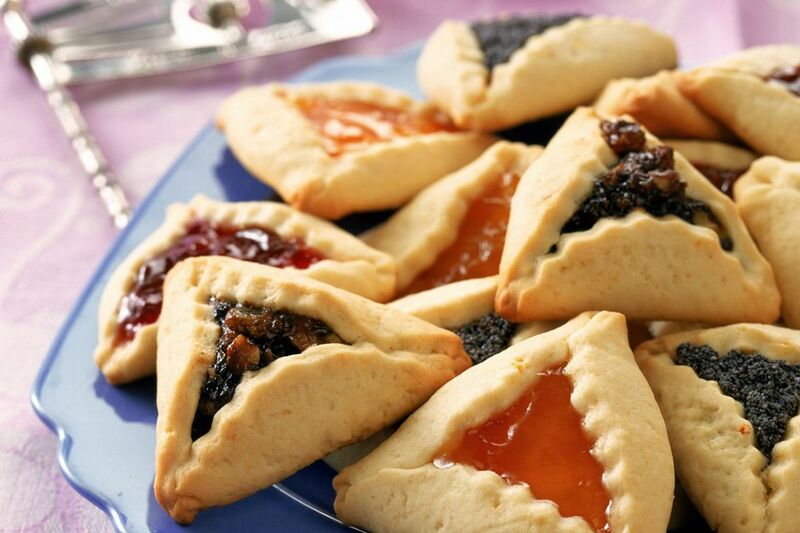 Why Are Hamantaschen Eaten for Purim? It's unclear if Haman ever wore a three-cornered hat, the reputed inspiration for these cookies that date to Germany in the late 1500s. The name comes from the German mohn (poppy seed) and taschen (pockets) and the pastries were known as mohntaschen which means "poppy seed pockets" or "Haman's pockets" (hamantaschen). The "pockets" reference alludes to Haman's pockets supposedly being filled with bribe money represented by "coins" of poppy seeds.